When a group of ten locals headed by friends Tim Wood and Phil Johnson bought the iconic Aireys Pub in 2011, they planned to save it from developers. What they didn't plan to do was build a brewery on the site too. Yet, after repelling the repeat advances of multinational breweries wanting to take over their taps and fridges, they decided they'd rather retain control. This way they could serve beer brewed fresh onsite, rather than going down the easier, but less satisfying, route of offering their customers the usual suspects. So, at the start of 2015, they turned this idea into reality and Rogue Wave was born. It was quickly embraced by the locals and, a year after commencing brewing, picked up a trio of medals at the 2016 Australian International Beer Awards. Among them was a silver for the hugely popular Moby Pale Ale, a hop driven number that was originally brewed for the Sea Shepherd, and another for their seasonal Ink Stout, a beer brewed with coffee beans roasted fresh onsite. Salt, a European-style lager, soon made it into the brewery's core range and quickly rose to be one of the surf-side brewery's better known releases. At the close of 2017, the Tim and Phil decided it was time for the brewery to undergo a name change and so Salt Brewing Co was born. Brewing all those beers is Chris Muggeridge, who moved from Little Creatures up the road in Geelong to indulge his passion for hands on brewing. The emphasis on local and fresh is matched in the kitchen, where there's a focus on seasonal produce. Both beer and food can be enjoyed inside by an open fire while gazing upon the historic lighthouse in the distance or the ocean nearby, or outside in a huge beer garden. Call in at the right time and you could be entertained too as the vast and sprawling Aireys Pub has live music playing throughout the year. All of the beers on tap can be sampled via surfboard shaped wooden tasting paddles, while several of them, including Salt, Moby and Cranky Mrs, are available in bottles across Victoria or to take home from the pub; 10 percent of profits from Moby sales goes directly to environmental warriors Sea Shepherd as promised by their "Drink a Pale, Save a Whale" slogan. You can even display your loyalty to the pub and its beers on your chest as the design conscious owners have produced t-shirts for pretty much the entire lineup. 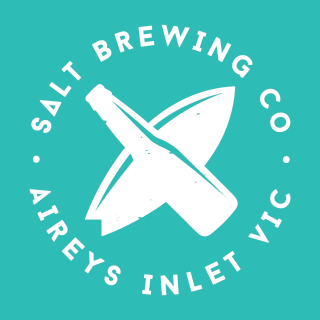 Salt has become an exciting addition to the burgeoning craft beer scene on the Great Ocean Road and the centrepiece of the iconic Aireys Pub. With its focus on quality, local, and fresh, it's a place well worthy of a visit on your next trip along the Great Ocean Road – or simply as a destination in itself.